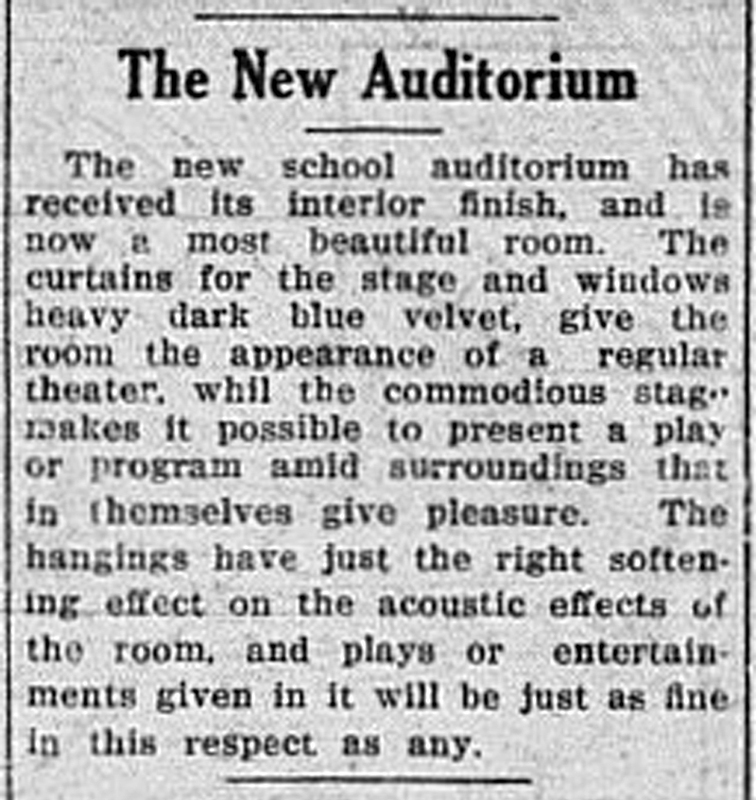 SCVHistory.com | Newhall School | Description of New Auditorium; District to Sell Old School Site, 1925-1926. Description of New Auditorium; District to Sell Old School Site. The "old" school building discussed here (which was actually the third Newhall School site) was located near the northwest corner of the Pico Road (Lyons) and Newhall Avenue. The new (1925) school building and auditorium were located at what is now 24607 Walnut Street — the current school location. The 1925 school and auditorium burned down in 1939; a new school opened on the same property in 1940, followed by a new auditorium in 1941. School Board Authorized To Sell. The Newhall School Board called a meeting at the new school house last Wednesday evening to consider the matter of selling or rather offering for sale the old school house and grounds. And incidentally the board asked that there be a full attendance of the taxpayers and school patrons, that the new house might be inspected by those to whom it belonged. It was rather a poor turn out for such a purpose, however, as less than fifty persons were present. Those who went, however, were well repaid by the inspection of the new building which has certainly been made all that a building should be for its purpose. Entering the front door, one passes directly through to the elegant auditorium, a very roomy structure, with a seating capacity for at least three hundred. AT the front is a stage large enough to put on any play that may be desired, while the sloping floor gives unobstructed view from any part of the house. At the right of the entrance is the principal's office, while at the left is the library. Beyond them on either side are four fine school rooms, the construction being such that two more rooms can be added any time they are needed and the funds are available. Abundance of locker room, as well as blackboards are provided in each room. Over the entrance way is a storage loft and a projection room, where it is planned to put a picture machine for movies. Curtains and wings for the stage will give the school a theater equal to any ordinary show or entertainment. The material of the building is reinforced concrete, one story, with tile roof, and is practically fire proof (emphasis added). The grounds contains nearly nine acres, and when they are put in order, will constitute as nice a school grounds as can be found anywhere. The meeting came to order after the inspection of the house, and Secretary Carr stated the object of the meeting, and asked for a resolution authorizing the board to act in response to the petition which had been filed asking action on the sale of the property. The resolution was presented, and after a discussion of the subject the vote was unanimous authorizing the sale. There will be three options presented. Bids for the ground alone, bids for the building only, and bids for the property as it stands. The board reserves the right to reject all bids. The date of the sale will be fixed later. The play ground fixtures are being removed from the old site to the new, as will the bungalow erected as an overflow room last year, which will be used as a kindergarten room. The Signal joins with the patrons who were on hand, in congratulating the school board on their work in erection of the fine building, and for their care that it should be well built. F.R. Lamkin, Mrs. R.F. Woodard and R.R. Carr compose the school board. A.B. Werts was a member last year, his term expiring a few weeks before the building was completed. Mrs. Beckley, the primary teacher, has moved to Newhall, and is occupying the Russell cottage. The new school auditorium has received its interior finish, and is now a most beautiful room. The curtains for the stage and windows, heavy dark blue velvet, give the room the appearance of a regular theater, while the commodious stage makes it possible to present a play or program amid surroundings that in themselves give pleasure. The hangings have just the right softening effect on the acoustic effects of the room, and plays or entertainments given in it will be just as fine in this respect as any.